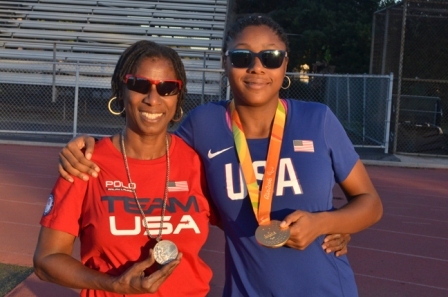 Olympic silver medalist Rosalyn Clark usually brings her daughter, Breanna when she visits Trinity Elementary School for the ‘Ready, Set, Gold!’ mentoring program. ‘Ready, Set, Gold!’ brings Olympians to schools in the Los Angeles Unified School District to teach kids how to prioritize fitness and health. The visits have a new meaning now that Breanna won a gold medal in the 400-meter event in the 2016 Paralympic games in Rio de Janeiro, Brazil. “They want their autograph signed,” Breanna said about the students. Rosalyn mentioned how the students want to see Breanna run. “Everybody wants to race her, all of the kids,” Rosalyn said. Since Breanna lives with autism, she competed in women’s 400 meters T20, the sporting class for people who have intellectual impairment. Breanna was the only representative of Team USA in the event. She advanced through the preliminary heat in 58.25 seconds. The next day was the final round and Breanna was the top seed, going up against Hungary, Poland, Malaysia, and Ukraine. In 57.79 seconds, Breanna bested her opponents to earn the gold medal. Natalia Iezlovetska of Ukraine earned silver with 58.48 seconds and Barbara Niewiedzial from Poland came in third with 58.51 seconds. “It was a remarkable moment, unforgettable,” Breanna said about being awarded the gold medal. Rosalyn coached her for the Paralympic games, their training includes imagery and breathing exercises along with physical training. The road to the gold medal in Rio de Janeiro was not easy, but the Clark family was committed to exposing Breanna’s talent on the world stage. Another challenge came when the family reached Rio and Breanna had to stay in the Paralympic village, this separated her from Rosalyn. She also was unable to see Breanna during practices at the stadium. “I was a little worried, but I was able to meet new people,” Breanna said about her time in the Paralympic village. After some initial anxiety, the separation helped Breanna become more independent, according to Rosalyn. Since Breanna has returned from the Paralympics, she still trains as she is preparing for the World Championships in London with hopes of breaking the world record.